Wii Sports Resort has not been developed solely as a game, but rather as part of a set in conjunction with Wii MotionPlus. For this reason, I’m planning to do two interviews: one with the team responsible for developing the hardware, and another with the team behind the software. I'm going to start with the hardware team. Would you be kind enough to briefly introduce yourselves? My name is Junji Takamoto and I work in the Development Group No.3 of Integrated Research and Development Division. On the Wii MotionPlus project, I was the project leader on the hardware development side. 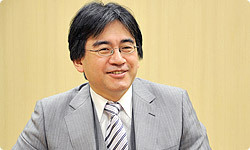 This is the second time you’ve taken part in an Iwata Asks interview since the original Wii hardware interviews, isn’t it? Yes, that’s right. It’s nice to be asked back. 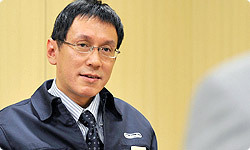 My name is Noboru Wakitani and I work in the same department as Takamoto-san. I was responsible for mechanism design on this project. My name is Kuniaki Ito and I work for the Development Group No. 2 in the Integrated Research and Development Division. On this project, I was responsible for the electrical circuitry side. My name is Keizo Ota and I’m in a different department from everyone else. I work in the Entertainment Analysis and Development Division, Design Technology Group. I was in charge of developing the SDK for this project. I should explain that the term SDK which Ota-san just mentioned is an abbreviation of “Software Development Kit”. Could you briefly explain what exactly it is? Put very simply, an SDK is a component used to develop games. I worked in a position where I acted as a liaison between the hardware team and the software dev teams. So my job was to produce the kit needed for game development and to then make this available to the software dev teams. But that’s not all you did, is it? You’re right. The accessory we’re discussing today has its own unique and extremely interesting features. But it has its fair share of idiosyncrasies too, so I was required to come up with a lot of ideas to try to deal with these. We’re going to have the opportunity to hear all about that very shortly. But firstly, Takamoto-san, could you tell me how the idea for Wii MotionPlus came about and when development got under way? Well, development got properly under way at the very start of 2008. 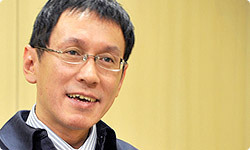 It was the head of my department, Genyo Takeda, who got the ball rolling when he said: "How about connecting the Wii Remote to a gyro sensor1?" 1 A gyro sensor is a measurement device. Its uses include calculating angle and rotation speed and controlling position. The term "gyro" refers to a "ring" or "rotation". When he made that suggestion completely out of the blue, weren’t you rather at a loss as to how to respond? After all, you’d just struggled to finally get the Wii Remote Jacket distributed worldwide and here you were being ordered to add a gyro sensor! Well, yes. And what’s more, we had to come up with a completely new jacket for the Wii Remote. You did, didn’t you? And what name did you come up with for this new Wii Remote Jacket? We called it the “Long Jacket”. In order to use the Wii MotionPlus accessory you have to exchange the existing jacket for the new “Long Jacket”, which is something I can well imagine will seem rather bothersome to some of our customers. Oh yes, I would certainly urge everyone to make use of it. In particular when playing games like Wii Sports, where there may be large numbers of people playing together. Since this accessory can detect different movements than the original Wii Remote, in addition to very fast movements, there needs to be even more attention paid to ensuring safe usage. 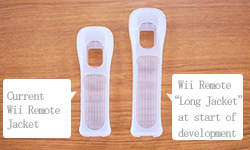 This is why we would urge all users to be sure to attach the “Long Jacket” when using Wii MotionPlus. Absolutely. And this is where the decision to combine the “Long Jacket” and the Wii MotionPlus accessory came from. No, the intention was to integrate the two from the very start. 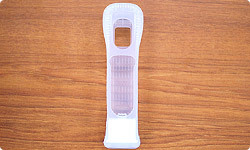 This is why when we use the term Wii MotionPlus, we are referring to the accessory with the "Long Jacket” attached. So tell me why you decided to go to all the effort of developing Wii MotionPlus in the first place? It was because the original Wii Remote could only detect movements along straight lines. This is to say that the accelerometer2 in the Wii Remote only responded to movements that were along straight lines - such as waving, thrusting and pulling. 2 An accelerometer is an electrical circuit element that can detect changes in speed. The accelerometer in the Wii Remote can detect the rate of acceleration in three dimensions. But it’s not able to detect the angle of the club’s face. Precisely. This is why it couldn’t distinguish between hooked or sliced shots . But when you combine the Wii Remote’s accelerometer with a gyro sensor, it can detect movement along 6 different axes. This means that it won't only detect movements along straight lines, but also movements like rotation and twist. This makes it possible to reproduce the movements of the player very faithfully, which is why we thought a gyro sensor would offer such huge advantages. I suppose the obvious question is: if it offers such huge advantages, why didn’t you use it in the Wii Remote from the very start? We actually looked into the idea of including a gyro sensor at the very start of the Wii Remote’s development. But the idea was rejected due to issues of both space and cost which attaching a gyro sensor would entail. I see. But gyro sensors are measuring devices that have actually been around for a considerable amount of time, aren’t they? That’s right. They were originally called gyroscopes and were used to measure angle and rotation speed in rockets and the navigation systems of ships. But they were very bulky instruments indeed. They’re fitted in the noses of aeroplanes as well, aren’t they? You used the term MEMS just now. Could you explain what that means? It stands for “Micro-Electromechanical Systems” and refers to micro fabrication techniques that use applied semi-conductor technology to produce extremely small mechanical structures. So thanks to MEMS technology, it has become possible to put a gyro sensor inside a small remote control. As I recall, WarioWare: Twisted!3 also made use of a gyro sensor. 3 WarioWare: Twisted! was the third in the Wario series, released for the Game Boy Advance in October 2004 in Japan. Well, that was a piezoelectric gyroscope and was a little different in nature from the one we’re using now. The impetus for the rapid increase in the use of gyro sensors actually came from their use in video cameras in order to correct camera shake. But there was no way the gyro sensors in cameras could simply be transferred across to be used in a Wii Remote. Yes, it has its share. It’s always been known as quite a tricky piece of kit to work with, but when Takeda-san first mentioned it, I must confess I had no idea that it would prove to be quite this awkward.